How Trilliant, SmartSynch (now Itron), Silver Spring Networks, et al. are tackling the cellular smart meter market. Integration, not competition, will determine who succeeds in the market. From all the talk about cellular smart meters we’ve seen lately, you’d think that sticking a cell phone in an electric meter was a new idea. But back in the day -- say, the mid-'90s -- it was all the rage. That’s the year that Trilliant, the Redwood City, Calif.-based smart grid networking company, first installed cellular radios “behind the glass” of commercial and industrial (C&I) electric meters, said Rob Conant, Trilliant’s chief marketing officer. Compared to the POTS, or “Plain Old Telephone System,” previously used to connect big customers to utilities, the technology from Nertec -- the company from which Trilliant emerged in 2005 -- was revolutionary. Trilliant was joined by a host of companies that are now part of the world’s biggest smart meter conglomerates, including Cellnet+Hunt (now part of Toshiba’s Landis+Gyr), and SmartSynch, the cellular smart meter company that was just bought by smart meter giant Itron for $100 million last week. SmartSynch’s claim to fame was to push cellular beyond C&I into the residential space, culminating in its $400 million, 1.9-million residential meter deployment with Michigan utility Consumers Energy in September. But the first wave of millions of residential smart meters have been dominated not by cellular, but by cheaper, utility-owned mesh networking technologies. Companies like Silver Spring Networks and Trilliant, along with big smart meter companies Itron, Landis+Gyr, GE and Elster, have made mesh the dominant technology in North America and a sizeable presence in Europe as well. While they all use cellular networks to backhaul data from meters to utility, the final communications leg remains data sent from meter to meter, usually via proprietary radios. Itron’s acquisition of SmartSynch has put cellular smart meters in the spotlight again, primarily as proof that cellular carriers are indeed cutting their rates to meet utility price points on the million-meter scale of mass residential deployments. IMS Research reports that U.S. telecoms have cut prices to $1 per meter or less per month, giving utilities that don’t want upfront capital expenses a reasonable alternative to building their own neighborhood-area networks. But according to Conant, the latest cellular news shouldn’t be taken as a new trend in the smart grid industry, but rather as a return to a long-running trend. “Cellular was really the chosen technology up until 2005. It switched to mesh and there was a big rush for a few years. Now, because cellular prices are coming down and carriers are getting more comfortable with service terms for utilities, it’s growing again,” he said. Trilliant’s CellReader technology is now embedded in C&I meters from General Electric (PDF) and Itron (PDF), and Conant said the startup’s behind-the-glass cellular meter business may rival that of SmartSynch's in size. 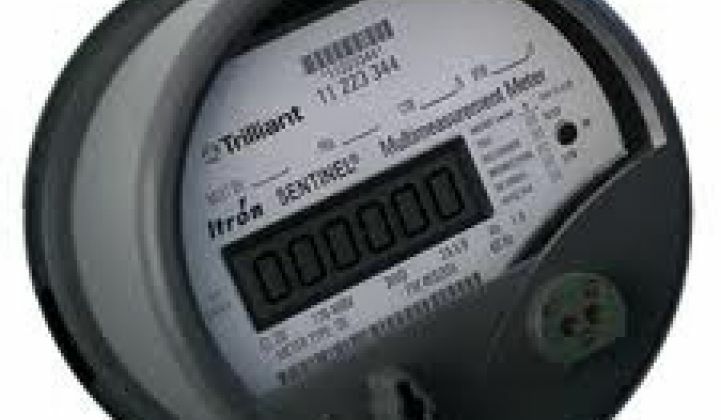 On the residential front, Trilliant is deploying both cellular and mesh-linked smart meters for its biggest customer, Canada’s Hydro One, Conant said, where it supports about 1 million of the 3.1 million smart meters the utility has rolled out in Ontario province. “The cellular guys, they basically expose an IP address for each meter, and the utility will connect to a VPN port at the carrier,” is how he described the simplicity of hooking up a smart meter via cellular. Most mass smart meter deployments will need alternative communications to reach remote rural customers, apartment dwellers and other “endpoints” that mesh has trouble serving. Indeed, Silver Spring Networks, the smart grid mesh networking startup of choice for North American utilities, is also jumping on the cellular bandwagon, though not all the way down to the individual meters. Instead, the Redwood City, Calif.-based IPO hopeful has added cellular nodes and connectivity options to its IP-based mesh networking technology. Another interesting contender is Grid Net, the smart grid startup founded on the idea of using 4G networks (initially WiMAX, but later LTE) to network the grid. The San Francisco-based startup announced a partnership with SmartSynch in November, though the two didn’t get into too many specifics of what they were planning. SmartSynch’s acquisition by Itron could complicate those matters. SmartSynch’s market is limited to North America at present, while Grid Net is working in Australia. But the United Kingdom represents the biggest prize for cellular smart meters in the near term, Conant said. That’s where British Gas has pledged to roll out about 16 million electrical smart meters over the coming years, starting with a one-million-meter project with Trilliant using Vodafone’s cellular network. Cellular has an advantage in the U.K.’s deregulated market, which allows retail electricity providers to switch customers as often as once a month -- something a utility-owned mesh network would find quite annoying, if not impossible, to manage. The government is pledging to spend up to $7.5 billion on contracts to build a national smart meter IT platform, a master meter data management service of sorts, to manage the meters built by one company, installed by another, and served by a rotating cast of retailers. In the U.S, only Texas faces a comparably complex market for building, installing, managing and using smart meters. On that note, Conant said that Trilliant has been linking its cellular and mesh smart meters in a single management platform -- something many other deployments don’t do. Utilities are notorious for keeping their IT and communications networks siloed off from each other, which means the cellular C&I meters of yesteryear and today’s mesh-linked residential AMI systems can’t necessarily share data, let alone interoperate. That’s probably going to change. Itron pledged to integrate SmartSynch’s meter networks into its OpenWay network management platform, syncing cellular and mesh in a single interface. Grid Net promises a master platform for managing disparate communications networks, as do a host of network management offerings from the likes of Cisco, SK Telecom, Proximetry and others. Qualcomm has been working with SmartSynch and Verizon on 3G and 4G cellular smart grid systems as part of a broader machine-to-machine (M2M) push. Whether or not utilities decide they need to link their old cellular C&I interval meters to their shiny new residential AMI platforms is less important than how future markets develop. What’s clear is that the smart grid will not be controlled by any one communications technology, which makes the contests of wireless mesh vs. cellular, or utility-owned vs. carrier-controlled networks, a bit beside the point. Integration, not competition, will determine who succeeds in the market.